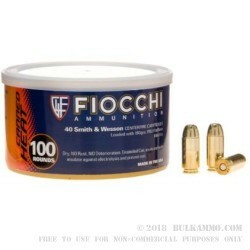 The Fiocchi Canned Heat .40 Caliber Smith and Wesson cartridge is topped with a heavy walled, copper encased, lead core, 180 grain FMJ or Full Metal Jacket bullet. Each 180-grain bullet is loaded carefully to a precise depth into a new, thick-wall, heavy-duty, non-corrosive Boxer primed, reloadable, yellow brass case. These cartridges have a muzzle energy that hits at 400-foot pounds, and the muzzle velocity is just at subsonic level pushing 1000-feet per second. These fine cartridges come packed in a 100 round easily identifiable, hermetically sealed Fiocchi "Canned Heat" can. These couldn't be easier to stock up on with the shape of their can and they will easily join you on your trips to the range, any shooting match, or for plinking with family and friends. Pick up a load of cans for your safe today! The 40 caliber Smith and Wesson was the right round at the right time, becoming a hit overnight in the Law Enforcement world. It quickly became the go-to round for Police Departments all over the USA. It was designed in 1990 utilizing a simple downsized 10mm brass case and the standard 180 Grain JHP or Jacketed Hollow Point bullet. Using a semi-automatic handgun for testing the round, Smith and Wesson and Winchester joined up to make the cartridge now known as the .40 caliber S&W. 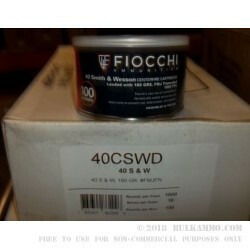 When you order this 40 SW ammo, you’ll get 100 rounds ready to fire in your pistol or carbine. If you want to really stock up, we offer this same exact load in a 1,000 round bulk pack for sale here. Q: Will you have these canned heat in 22 long rifle. A: We may at some point in the future have Canned Heat .22LR ammo, but these plans are not definite.